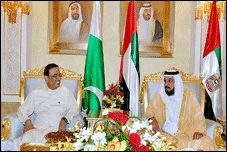 United Arab Emirates and Pakistan are in close relationship from almost 42 years. Relation of Pakistan and UAE has become a good example of friendship. Pakistan is one amongst those countries who acknowledge the freedom of UAE. People of Pakistan has great role in the development of UAE. The people of UAE will never forget the services of Pakistanis. UAE is a strong supporter of Pakistan in every situation. Whenever Pakistan faces a problem UAE stands with it. Pakistan faces a lot of natural blights frequently and UAE supports it whenever help is needed. After palestine , Pakistan is the second country which take help from UAE in different forms. In July 2010 Pakistan faced heavy floods. This flood destroyed the houses of millions of people. Communication system, school, hospitals were affected badly. Almost 2000 people died in 5 days. Different epidemic diseases were spreading. It was winter and cold weather made the situation worst. The estimated loss was 10 billion dollars. At that time UAE helped Pakistan on emergency basis. Almost 85 million dollars were given to Pakistan. Armed forces of UAE were working in affected areas. They saved the lives of peoples in flood affect areas. RED CREScENT and “KHALIFA BIN ZAID NAHYAN” foundations were prominent supporter at that time. UAE government has started more than 200 projects in different areas of Pakistan. In rural areas UAE made water canals, schools and basic health units. 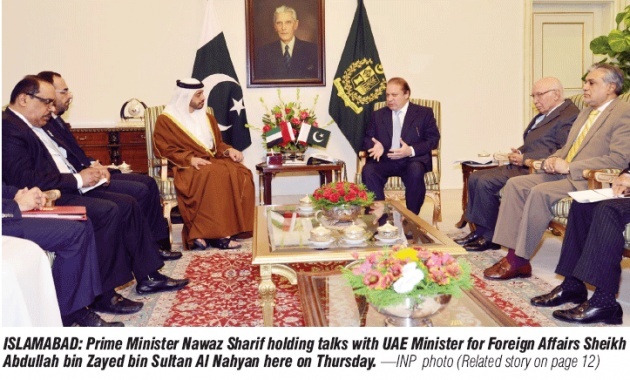 UAE is a greater supporter of Pakistan against terrorism. 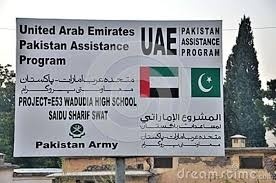 For this purpose UAE started “Pakistan assistance project” in 2010. This project will work for the rehabilitation of those people who are affected by terrorism and other natural blights. In 2011 UAE provided thousands of tents and other nutritional material for the rain affected areas of Sindh. Thousands of Pakistanis are working in UAE and UAE government provides them every facility. The friendship of Pakistan and UAE is ever lasting. And hopes that UAE will support Pakistan in every situation in future.